For the first time in over a decade, The City of Seattle Human Services Department is facilitating an open and competitive funding process for homelessness services and support. The Homeless Investments RFP seeks applications from agencies that provide services that support movement toward and access to permanent housing for people experiencing homelessness. $30 million in funding is available through this RFP. Awards will be given to service providers that demonstrate the ability to address the RFP Program Areas: Homelessness Prevention, Diversion, Outreach & Engagement, Emergency Services, Transitional Housing, Rapid Re-Housing and Permanent Supportive Housing, and to deliver person-centered services, show results, and address racial disparities. People experiencing homelessness in King County are our neighbors, and overwhelmingly local. Homelessness is not a choice. Pathways Home is the City of Seattle's framework for addressing homelessness. This framework is driven by three guiding principles: 1) Create a Person-Centered, Systemic Response; 2) Invest in Programs that Work; and 3) Address Racial Disparities. During 2017, HSD is implementing actions in six key areas that work together to improve services for people who are homeless, in addition to competitively bidding funding opportunities through the Homeless Investments RFP. The Human Services Department provides services for people experiencing homelessness by funding agencies and organizations in the community. In 2016, HSD signed a Memorandum of Understanding with All Home, King County, and United Way of King County committing to collectively align homeless system providers through funding investments and other strategies. These funders agreed upon 5 performance targets for results. 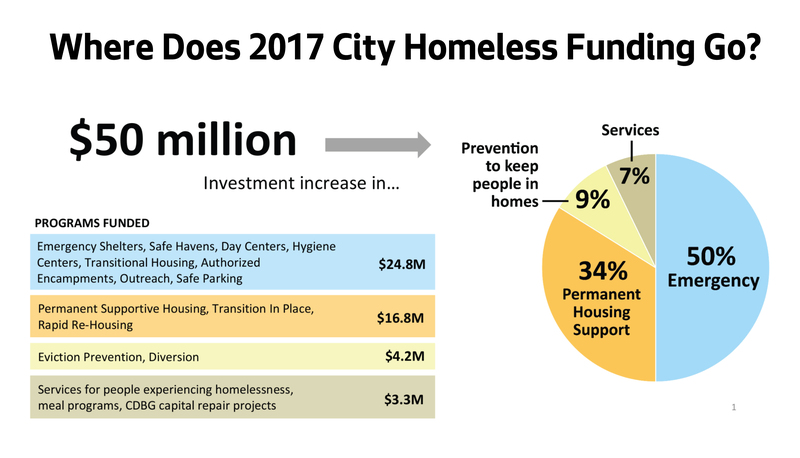 In 2017, HSD's Homeless Strategy and Investment Division released $50 million to community-based organizations that provide emergency services, permanent housing support, diversion, and general services for people experiencing homelessness, among other service areas. As part of Pathways Home, HSD chose to release a competitive RFP in 2017 for homeless investments. In releasing the Homeless Investments RFP, HSD will align its investments with the Pathways Home principles (Create a Person-Centered, Systemic Response, Invest in Models with Demonstrated Success, and Address Racial Disparities) and with broader system transformation efforts outlined in the MOU.